AS A USER OF IPCOMMS ("IP COMMUNICATIONS, LLC.) SESSION INITIATION PROTOCOL (“SIP”) BASED VOICE OVER INTERNET PROTOCOL (“VOIP”) SERVICES, YOU ARE REQUIRED TO AGREE THAT YOU HAVE READ AND UNDERSTOOD THE LIMITATIONS ASSOCIATED WITH THE 911 AND E-911 EMERGENCY SERVICES AVAILABLE THROUGH THE IPCOMMS CALLING SERVICES. IF YOU DO NOT AGREE, YOU ARE NOT AUTHORIZED TO USE ANY IPCOMMS CALLING SERVICES. 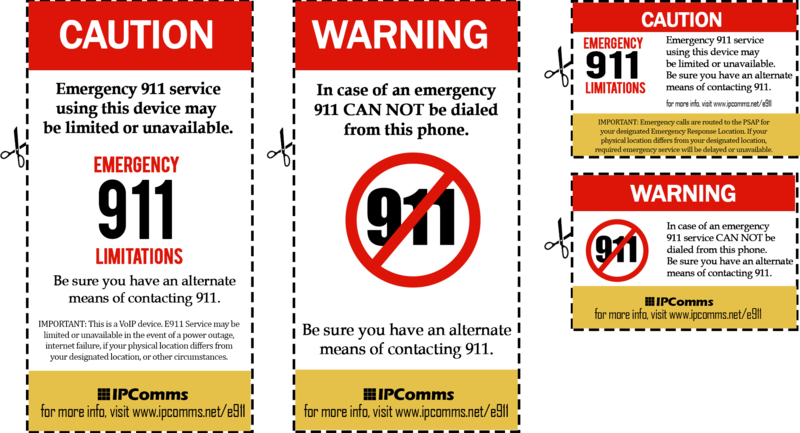 YOU MUST PRINT THESE LABELS AND PLACE THEM ON OR NEAR ANY DEVICES THAT ARE USED WITH OR CONNECTED TO IPCOMMS SERVICES. Failure to provide a correct physical address in the correct format may cause all Basic 911 Service or E911 calls to be routed to the incorrect local emergency service provider. Furthermore, use of any IPComms calling service from a location other than the location to which such service was ordered, i.e., the “primary registered address,” may result in Basic or Enhanced 911 calls being routed to the incorrect local emergency service provider.